The ESO Very Large Telescope Interferometer (VLTI) has made its first observations that combine super-sharp imaging with measurements of motion. 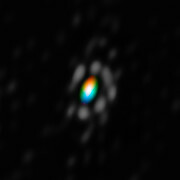 New pioneering data from the VLTI/AMBER instrument not only show extremely fine details of the gas and dust disc surrounding the brilliant supergiant star HD 62623, but also, by using spectroscopy, reveal the motions of the material in the disc for the first time. The origin of this disc has been a mystery, as such a bright star, which is near to the end of its life, is expected to blow away the material surrounding it, and not to be surrounded by a dusty disc similar to those around very young stars. A team of astronomers led by Florentin Millour (Observatoire de la Côte d’Azur, Nice) has now found that the material is orbiting the star — just as the planets in the Solar System orbit the Sun. Surprisingly they find no evidence that the material is streaming away from the star. The most likely explanation for the existence of this unexpected disc is that the star has a much smaller companion, with a mass similar to that of our Sun. The presence of this companion is also thought to be the explanation for the cavity between the gas disc and the central star that can be seen in the new data. The AMBER VLTI instrument combines the light collected by multiple telescopes at ESO’s Paranal Observatory to form a virtual telescope with an effective size of up to 130 metres. These observations show details fifty times finer than can be seen in images from the NASA/ESA Hubble Space Telescope at the same wavelength . This is the first time that AMBER’s power to resolve extraordinarily fine detail has been combined with its ability to also obtain spectra of different parts of an object. This added spectral information allows astronomers to study the motions of the glowing gas in space. The resolution of the new VLTI images is better than 0.004 arcseconds — corresponding to the size of the head of a bolt on the International Space Station, seen from the surface of the Earth 400 km below. The images reported here were taken at a wavelength of 2.2 microns. This research was presented in a paper to appear in Astronomy & Astrophysics. The team is composed of F. Millour, O. Chesneau, P. Stee, R. Petrov, D. Mourard (Observatoire de la Côte d’Azur, Nice, France), A. Meilland (Max-Planck-Institut für Radioastronomie, Bonn, Germany), S. Kanaan (University of Valparaiso, Chile) and S. Kraus (University of Michigan, USA).